Parents, grandparents, aunts, uncles, and camp counselors! We haven’t hit the solstice yet, but Memorial Day is the unofficial start of summer. Time to think about what the kids will be up to for the next few months. Would you like to divert them away from mind-numbing, thumb-mashing video games and get them into the garden for some good clean dirty fun? 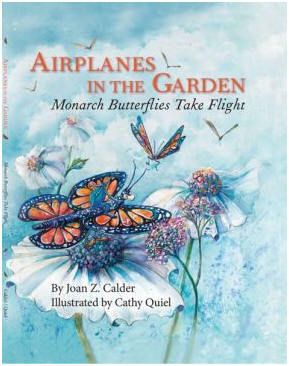 Then flip open a copy of Joan Z. Calder’s book, Airplanes In The Garden: Monarch Butterflies Take Flight, and get ready for action. I can’t think of a more rewarding, long-lasting summer strategy for entertaining (and stealthily educating) youngsters than reading this fancifully illustrated, engagingly written, instructional book. 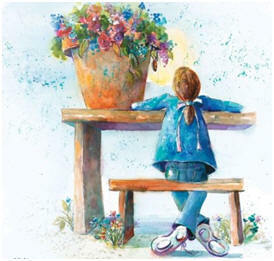 It’s about Sergio and Stanley, a couple of monarch caterpillars who appear one day in a young girl’s garden. Mom seems to have a pretty good handle on butterfly life cycles (she must have been the star pupil in her entomology class), and explains to her daughter how momma butterflies lay tiny white eggs under milkweed leaves. And how little, striped caterpillars emerge, turn into chrysalises, only to reappear as delicate butterflies. Here, Bonnie’s story ends, but the book continues with maps showing the migratory routes monarchs follow at different times of the year, and a page loaded with fascinating facts about these wonders of nature. (Bonus for grown-ups: “Monarchs taste with their feet” is the ideal icebreaker at swanky cocktail parties.) There are links to useful resources, including the PBS NOVA episode, “Journey of the Butterflies”, and the University of Kansas’ Monarch Watch website. If you find yourself motivated to start a butterfly garden, the book ends with instructions for growing your own butterfly haven, including the best food plants for adults (nectar-producing) and caterpillars (they’re leaf-munchers). Joan Calder is a passionate horticulturist and garden designer living in Santa Barbara, CA (hey, so do I! ), She manages a greenhouse for the Department of Ecology, Evolution and Marine Biology at the University of California, Santa Barbara, and nurtures a butterfly garden. The author loves visiting libraries, botanic gardens, and schools, teaching children and adults about the habits and charms of butterflies. As engaging and well-written as the book is, it’s Cathy Quiel’s giddily rendered, quirky water-colors that will keep readers poring over each page. Her colors are enchanting and rich, and every page is populated with smile inducing little “asides”, like a ladybug flight attendant balancing a cheese sandwich on her back. 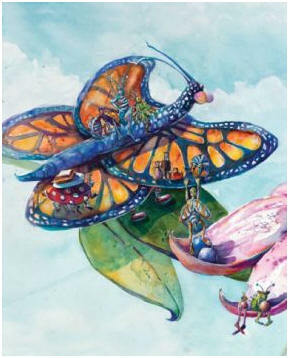 I want to see Airplanes in the Garden in homes, libraries, classrooms, and nurseries. When that’s done, I hope to hear about well-loved, slightly soiled, weathered copies of this book finding their way outdoors and into garden. And when the magic is complete, the soft fluttering of delicate, but hard-working orange and black wings.